What 3DS Zelda Do You Hope to See Next? There’s been a lot of talk recently about other Zelda remakes for the Nintendo 3DS. The majority of this talk surrounds Majora’s Mask, most likely due to it being a direct sequel to Ocarina of Time, which is already being remade. Shigeru Miyamoto himself said that he would like to do a remake of A Link to the Past, which is another very popular Zelda title (and in 2D, none-the-less!). Ocarina of Time has lost its 3D remake virginity, and it looks like the other Zelda games are eager bachelors just waiting to be chosen by the 3DS. We happen to like bachelors here. A lot, in fact. That’s why we’d like to know which bachelors are the hottest right now. Readers, it is up to you. Which Zelda game do you think should be made for the 3DS next? Could it be the Ocarina of Time’s smoking hot sibling: Majora’s Mask? Could it be the classy, original The Legend of Zelda? 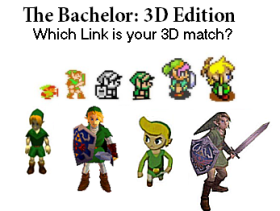 Perhaps your tastes are more exotic, and your crave a bachelor from the islands such The Wind Waker or Link’s Awakening. Whichever it is, we’d like to know! Leave your opinion in the comments below.